Good Choice Reading: Review: Soul Survivor by Misty Evans! 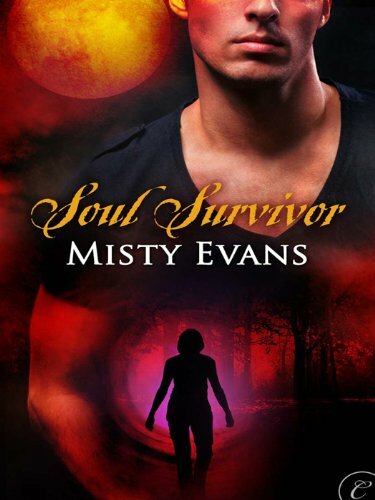 Review: Soul Survivor by Misty Evans! Haunted by tragedy, FBI profiler Rife St. Cloud is driven to find the person who brutally attacked six women. Unfortunately the only survivor, Keva Moon Water, has no memory of what happened, and the evidence makes her the prime suspect. Keva cannot die. She has waited a thousand years to be reunited with the man she loves, whose soul sleeps within Rife. Though he refuses to believe her claims of immortality, there's no denying the passion that burns between them. Keva desperately hopes their sexual connection will be enough to awaken Rife's memories of the love affair that started a war and bound their souls together for all eternity. Rife is a hard working FBI profiler. So hard working in fact that he is sent home by his superiors because they are afraid he will burn himself out. To Rife, Keva is a stranger who seems to know him almost better than he knows himself. Keva cannot die because she abused her powers a thousand years ago. Keva and her true love Kai's soul have been like two ships passing in the night. They have lived in the same places but have never seen each other but now Keva sees her true love in Rife. At the start of this story she has no memory but as time goes on she realizes her past misdeeds and tries to set things to right. Rife and Keva have a real strong sexual chemistry. Keva knew it would be hard to convince Rife that he is the reincarnation of her love Kai because he is a no non-sense, by the book, matter of fact type of guy. I liked how everything played out. The way Rife was described made him drool worthy, which is important in a hero....lol. Keva was a strong heroine who finally knew what she did wrong and went about trying to right her wrong. There was a villain in this story that seemed like it would be hard to defeat but actually wasn't so that was kind of a big letdown. With that being said, I still really liked the heat between Rife and Keva and their story was enjoyable enough to almost make up for the easily defeated villain. On a scale from 1-10 I give Soul Survivor an 8 simply because of the villain. If you are looking for a time-travel story with great characters with great sexual chemistry then Soul Survivor is the book for you. While you are picking up Soul Survivor keep an out for book 2 when it comes out. It's been a while since I've read a time travel romance story, so thanks for the recommendation. I love time travel stories, so I'm looking forward to reading Soul Survivor.